After a World launch in 2016 and the growing popularity of the Sunreef Supreme 68 model, the Polish shipyard is taking another step forward and introducing a consistent continuation of the Supreme philosophy with a full line up from 48 to 88 feet. 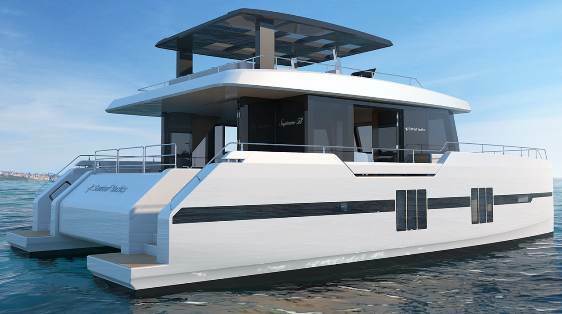 Enters the project for a Sunreef Supreme 58, an ultramodern Power Catamaran yacht combining the advantages of the range and opening a world of new possibilities. 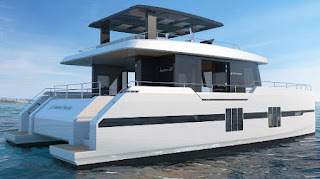 She is the industry’s first boat of this size to offer truly extreme living spaces equaling 225 squared meters and a spacious aft garage being a world innovation implemented for the very first time on a catamaran of eighteen meters in length. The Sunreef Supreme 58 boasts a massive main room surrounded with floor to ceiling glass, a seamless space opening wide onto the cockpit and giving direct access to the deck through folding doors on both sides of the yacht. The bow of the deck house offers enough space to install a spectacular full beam master cabin with a panoramic sea view. The layout of the saloon is entirely custom and can feature a big lounge, bar and dining table. The design of the hulls offers the possibility to install a generous master suite, and up to four luxurious guest cabins and crew quarters with a fully equipped galley. The innovative concept of the Sunreef Supreme 58 features an immense flybridge topped with an elegant hard-top. This scenic area can be fitted with bar and sofas to obtain a vast dining and lounging space. The yacht’s front terrace is the place to relax on the generous sun pads or to enjoy a lengthy bath in the jacuzzi. The Sunreef Supreme 58 Power offers numerous engine options from twin 220hp up to 435hp units and can also be equipped with IPS propulsion to facilitate maneuverability.